How do you tell the story of a PLACE? New technologies like geo-tagging, location-aware devices, interactive video and augmented reality are being combined with traditional storytelling methods like documentary film and oral history to explore the world in richer, more in-depth ways than ever before. Using these tools and techniques, creators can now fully consider a location itself as one of the “main characters” in their narratives. 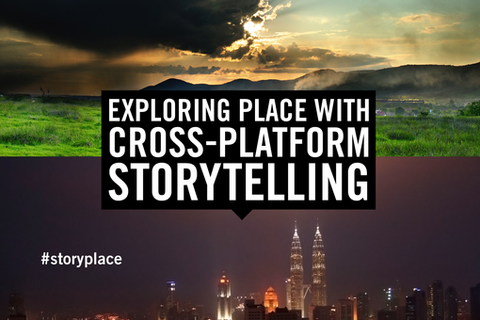 Panelists include storytellers, practitioners and technologists who are creating the next generation of place-based storytelling. A digital veteran of 20 years, Mike Knowlton has always pushed the boundaries of storytelling and technology. As a Creative Technologist he founded and led numerous technology companies including user-interface design firm Nascent State, digital agency BASIK (www.basikgroup.com), and open-source Flash technology Frontal (www.frontalcode.org). Mike has led large multi-disciplinary teams in developing complex software applications for brands including Bath & Body Works, Epoch Films, Gucci, MoMA, New York Magazine, Philosophy, Theory, Tiffany & Co., and Victoria's Secret. At his most recent venture Murmur (www.murmurco.com) he produces social films and consults with leading brands, studios, and networks on using social films to extend existing properties. Mike's background spans design, programming, advertising, and filmmaking. He graduated with a Bachelor of Arts from Miami University. After over 10 years as head of cinema for the french german public broadcaster Arte in Paris, producing over 25 independant films from all over the world yearly, and buying over 160 features yearly, I am now an independant transmedia and story writer/ Director / Consultant. My past includes various experiences in many different countries, being : a dancer, a film/theater/ dance producer, CEO of several prestigious cultural institutions in France, a film maker, a ground breaker since the early 90's in participatory, interactive live events and experiences. The influential culture blog Flavorpill called filmmaker and multi-platform producer Liz Nord a "fierce, youthful visionary." Her current project, Jerusalem Unfiltered, is a transmedia documentary exploration of art and activism in contemporary Jerusalem. Her first film, Jericho's Echo: Punk Rock In The Holy Land, a critically acclaimed documentary about young Israeli musicians, screened at over 100 festivals and venues worldwide. In 2009, she shot a documentary on-location in Haiti for musician Wyclef Jean's NGO, Yéle Haiti. In 2008, she ran MTV's Street Team '08­­­: a groundbreaking, Emmy Award-winning project wherein 51 state-based citizen journalists covered the 2008 presidential across all media platforms. Nord moved to Brooklyn from San Francisco, where she ran a media training organization for at-risk youth and served on the Board of Directors of Bay Area Women in Film and TV. Her professional history is in designing award-winning websites and educational multimedia projects. Danny is an internationally recognized storyteller. His work has been featured by TIME, New York Times, Wall Street Journal, National Public Radio, NBC, and the Washington Post calls him a “modern-day Stud’s Terkel”. A graduate of Princeton and former terrorist financing analyst, Danny uses StorySocial to help businesses, cities, foundations, and non-profits more effectively collect and share their stories and build stronger online and offline communities. A regular speaker and storyteller, he has delivered presentations around the world. He sits on the Board of the Awesome Foundation - D.C.